Cancer is rising and is expected to become the leading cause of global deaths in the 21st century, according to experts from a World Health Organization research agency on cancer. Lung cancer is the most common and the leading cause of cancer deaths, the agency found in its newly published study, the first since 2012. 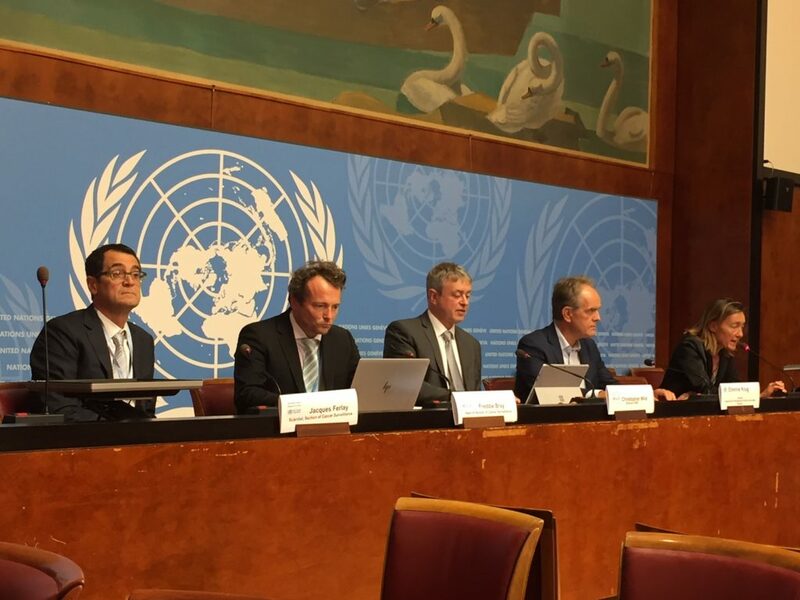 However, political commitment lags behind when it comes to prevention, speakers said at a press briefing at the UN in Geneva today. The International Agency for Research on Cancer (IARC) today launched its Global Cancer Statistics 2018, estimating incidence and mortality worldwide for 36 cancers in 185 countries. The study builds on an analysis of the accessible database GLOBOCAN 2018, part of the IARC Global Cancer Observatory. The IARC is the research agency on cancer of the WHO, and is located in Lyon, France. The observatory has accessible online tools allowing to get national estimates, but also makes projections for the next 20 years, according to speakers from the IARC at today’s briefing. The report estimates that some 18.1 million people will be diagnosed with cancer in 2018, and 9.6 million cancer patients will die. Freddie Bray, head of Section of Cancer Surveillance, IARC, said at the briefing that globally one in 5 men will develop cancer in their lifetime, and one in 6 women. One men in 8 will die of cancer, while one woman in 11 will die of cancer. Cancer has become a major public health issue, he said, with by 2040, the number of people diagnosed with cancer projected to be 29.4 million. “Noncommunicable diseases (NCDs) are now responsible for the majority of global deaths, and cancer is expected to rank as the leading cause of death and the single most important barrier to increasing life expectancy in every country of the world in the 21st century,” states the report. Overall, lung cancer is the most commonly diagnosed cancer, with over 11 percent of all cases, and the leading cause of cancer death (18.4 percent). The second most common cancer diagnosed is female breast cancer, followed by prostate cancer and colorectal cancer, while the most deadly are colorectal cancer, stomach cancer and liver cancer, according to the report. They also note that the rising prominence of cancer as a leading cause of death partly reflects marked declines in mortality rates of stroke and coronary heart disease in many countries. The authors estimate that nearly one-half of the cases and over one-half of the cancer deaths in the world will occur in Asia in 2018, in part because close to 60 percent of the global population lives there. Cancer incidence and mortality is quite high in Europe, accounting for over 20 percent of both total cancer cases and cancer deaths, while making up only 9 percent of the global population. Europe is followed by the Americas with 21 percent of incidence and over 14 percent of mortality worldwide. The study found that worldwide, men develop more cancers than women by about 20 percent, and that incidence rates of breast cancer are highest in Australia/New Zealand, Northern Europe (including the United Kingdom, Sweden, Finland and Denmark), and Western Europe (with Belgium having the highest global rates, followed by the Netherlands and France). Large disparities in availability of high-quality local data in many transitioning countries have “direct consequences for the corresponding robustness of the estimates presented” in the study, the study authors remarked. Jacques Ferlay, a scientist at the Section of Cancer Surveillance, IARC confirmed those disparities at the briefing. He said incidence data were missing in countries, in some European countries for example, and much of Latin America. In Africa, there are mostly no cancer mortality incidence data, he said. The data shows that not enough is being done “despite repeated commitments” made by WHO member states. Cancer is now a reality in all countries of the world, he said, adding that for main cancers, a lot could be done to prevent them, such as reducing risk factors such as tobacco and alcohol consumption, improper diet, air pollution, and lack of physical activity. Christopher Wild, director of IARC, said during the briefing that the study did not attribute causes to cancers listed in the study, but he remarked that the “most dramatic changes” in global risk factors are obesity and reduced physical activity. Cancer should not be a death sentence anymore, Krug said, stressing the importance of improving early diagnostic and making sure patients can have access to proper treatments, which he said, often remain too expensive. He underlined the work conducted by the WHO on cancer, including support to countries to develop national plans and strengthening their registries. Elimination of cervical cancer is one of the WHO priorities, as well as childhood cancer. Krug remarked that in developed countries, some 80 percent of children with cancer survived, compared to 20 percent in developing countries. The WHO also helps strengthen workforce capacities in developing countries, and on prequalifying medicines in order to facilitate access to drugs, he said. He also mentioned the Third United Nations High Level Meeting on Non-communicable Diseases taking place on 17 September. Krug remarked that many cost-effective prevention measures could be used by countries, such as immunisation, and tax on tobacco and alcohol products. The issue, he said, is to get awareness of such measures in countries and commitment. Wild added that very little aid money goes into cancer prevention. He cited for example the fact that mammography-based screening for breast cancer in sub-Saharan African is not going to happen very soon, and some alternative ways of diagnosis have to be developed. Cancer control should also be tailored to local conditions and risks, the study found, such as infection rates, obesity, and ultraviolet radiation, for example.